maybe these would be better? They work when dancing too - not the best idea!!! How cute!! Poor little guy has quite the shiner on his forehead! luckily not done at our house. Jumping on his bed and hit the wooden side ouch!! What a cutie!! and wow those are mega needles! Such cute pictures! When my guys were little they would have turned the knitting needles into "weapons." This is just beyond darling! 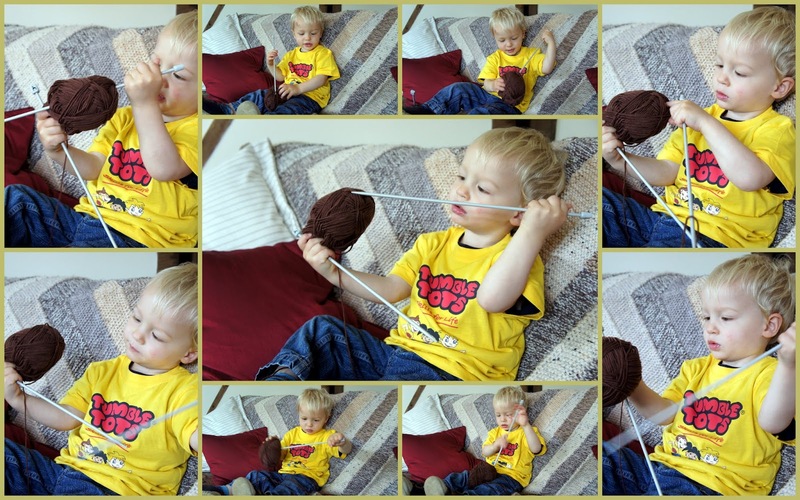 Looks like he is all ready to be a fantastic knitter like his grandmother! Oh man. This was the sweetest thing. Made me smile so hard, and I had to share with my family. Just sooo cute! My son does the same thing.